I think I’ve got to stop crying so much in church. It’s getting embarrassing. You can only hold it in so long before it wells up at the bottom of your eyes and one blink sends a little stream down your cheek. I usually do the move where you discretely move your index finger flush across your eye like a windshield wiper to remove the tears. It was a fitting end to the Intentional Disciplemaking Church Conference at Faith Community Church. It was also Father’s Day. 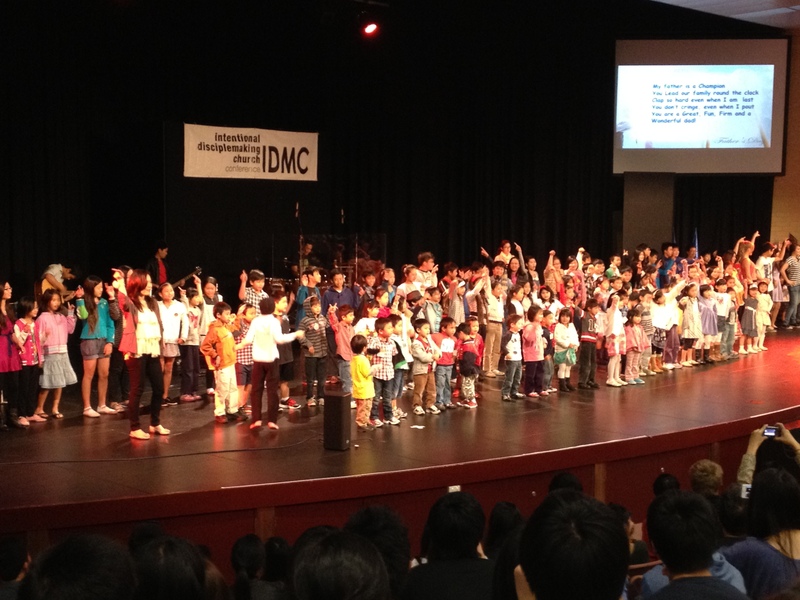 The photo above shows the huge children’s church filling the stage as they presented a special item. Not only was it cute and heartwarming, it was as if God was putting on metaphorical display the potential of the next generation. Pastor Benny shared a moving story about how when he started out in ministry, he was a slight figure with a squeaky voice and how he struggled to get speaking engagements. He shared how depressing his journey had been, and it was difficult not to feel sorry for him. But the turning point came when a Methodist pastor looked him in the eye and said “I believe in you” and then asked him to teach a Christian Education class. This became the launching pad for his future ministry. The story made me think about all the mentors who had, in one way or another, shaped my life and ministry because they had believed in me and the potential of God in my life. Like my first youth group leader, who took a bunch of young, immature guys and told us we could do anything in Christ. Even though we were very young Christians, I remember how he sat us in a circle and told us he believed we could hear from God for a word of knowledge or prophecy, and he made us practise it. I remember a pastor who saw that I had the gift of leading worship from a young age and gave me opportunities to lead, first in a cell group, and then in a Sunday service. I remember a cell leader who met up with me regularly and used to pass me Kent Henry CDs because he saw the potential in me to lead worship with a prophetic intercessory edge. And the worship pastor who believed that God could use me in the city and on the mission field; and that God had given me a calling in intercessory worship for the nations. And another worship pastor I met 7 years ago in a coffee shop who taught to me to dream big; to see worshippers coming together as gatekeepers for the release of God’s glory in the city. And my old senior pastor, who taught me to value God’s Word. That’s the power of believing in someone! As Pastor Benny put it in his message today, we all need sponsorship. We all need someone to believe in us first. I am convinced that Faith Community Church is about to enter a new season of growth as we connect, equip, mentor and release the next generation of leaders! Pastor Benny concluded his message with a challenge to the sons and daughters as well. Not only is God turning the hearts of the fathers to the children, but also the hearts of the children to the fathers. We all need to have a heart of spiritual sons and daughters, committed to the house of God, realising that we don’t pursue our own vision, but the Father’s vision; that we are called to build the house out of love, not out of duty. Those words really struck me. Having been a “son of another house”, a congregation in which I had been a part for 21 years, it was actually hard to let go of the past, to keep referring to that congregation as “my church” or “my old church”. I remember even in the first few months I was at FCC, I would say (referring to FCC), “this church” and “your cell group”. But I was convicted this morning. Hi Lester, this is very encouraging! I was moved by that. Keep shining for Jesus!! You are an inspiration! Thanks pastor Benny. I am encouraged too!